Small and medium-sized businesses (SMBs) are always looking for new and innovative ways to cut costs, without affecting business output or future growth. 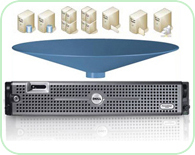 Virtualisation dramatically improves the efficiency and availability of resources and applications in your organization. Internal resources are underutilised under the old “one server, one application” model and IT administrators spend too much time managing servers rather than innovating. Our customers typically save 50-70% on overall IT costs by consolidating their resource pools and delivering highly available machines through our Virtualisation Solution. Pool common infrastructure resources and break the legacy “one application to one server” model with server consolidation. Contact our customer service team to find out how your business can take advantage of this solution!